Regular Tarot Bags - Pirates Treasure Regular Tarot Bag - Tarot Bags, Tarot Cards, Cloths, & More! Are there certain suits of the minor arcana or images on the tarot cards that you are especially fond of? Are there some symbols that have become personal symbols for you? If so, this may be the ideal bag for you. The fabric of this black tarot bag is simply covered with the same symbolism that is to be found on tarot cards: chalices and coins (both are suits of the minor arcana); crowns and jewels (both seen on court cards and several major arcana cards); a key and keyhole (the cards/secrets unlocked). Coordinations: What a perfect bag this is because it will coordinate with any deck! 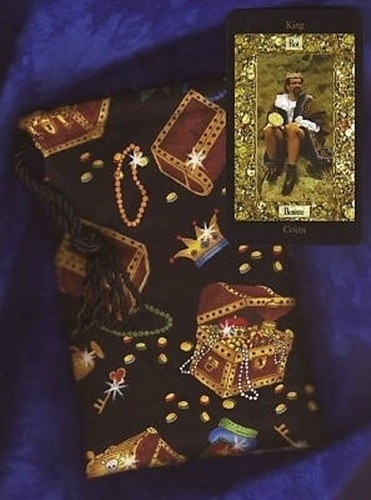 It is shown in the picture with the King of Coins card from the photo-collage deck, The Vision Tarot. Another obviously highly appropriate deck coordination is with the Tarot of Pirates by Bepi Vigna with artwork by Michele Benevento. Size: Regular, which fits tarot decks of 3 x 5 inches or smaller. Select a coordinating cord of your choice from the option box below.